A Practitioner’s Guide to Health Informatics in Australia is published by the Health Informatics Society of Australia (HISA) as a comprehensive body of knowledge for the competencies required for the Certified Health Informatician Australasia (CHIA) program; a valuable asset for CHIA candidates. The Practitioner’s Guide has also been developed with other purposes in mind, including orientation for professionals such as clinicians or informaticians new to health informatics and updates for health informaticians wishing to maintain the currency of their knowledge irrespective of certification. 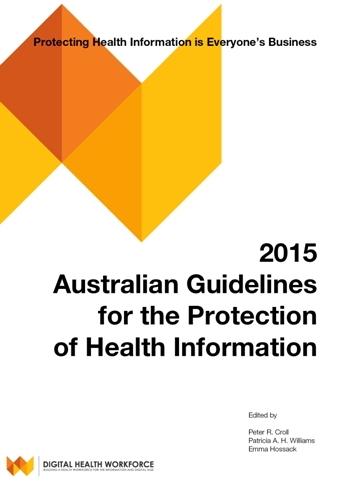 It focuses explicitly on the needs of practitioners in the field of health informatics in Australia. •To educate healthcare professionals and organisations about the privacy rights of their subjects of care. •To assist healthcare professionals and organisations to minimise the risk of inappropriate, insecure, or unauthorised collection, use, disclosure, modification, storage, or destruction of PHI. •To assist healthcare professionals and organisations to maximise the integrity, availability, and confidentiality of PHI, and the efficacy of administering authorised access. •To assist healthcare professionals and organisations to design and/or implement programs to protect the privacy and security of personal health information. Welcome to the HISA bookstore.